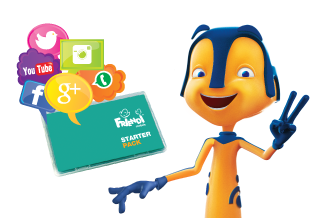 Just get hold of the FRiENDi SIM Starter Pack with the latest offer. To buy a SIM Starter Pack, you can visit FRiENDi mobile’s shop in Al-Asalah building, kiosks at the Oman Avenues Mall, Muscat City Center or the Muscat International Airport. The starter packs are also available in thousands of stores across the Sultanate of Oman. To receive data settings for your handset, dial *144# or click DATA SETTINGS. Looking for amazing data plans? Visit the nearest FRiENDi mobile dealer or our kiosks, to get your SIM starter pack. If you experience any problems, please call us on 1252 or 98400000 so we can help you.